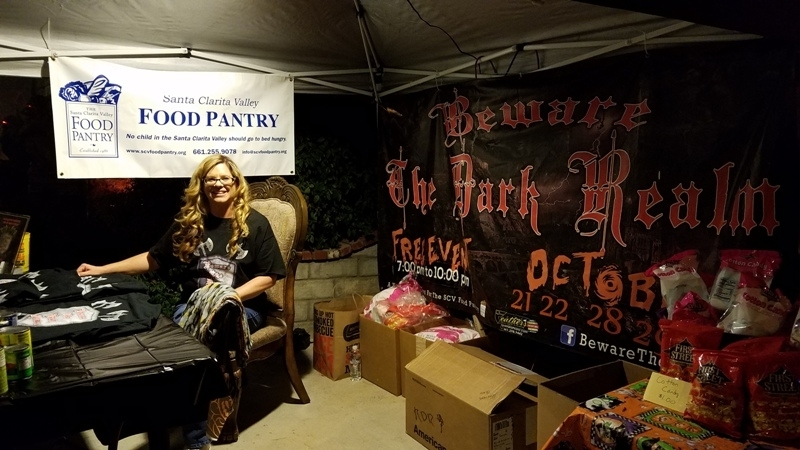 Tonight I was invited by TPR and Christian and Scott Sivley to check out Beware the Dark Realm - a free local haunted maze that benefits the Santa Clarita Valley Food Pantry. 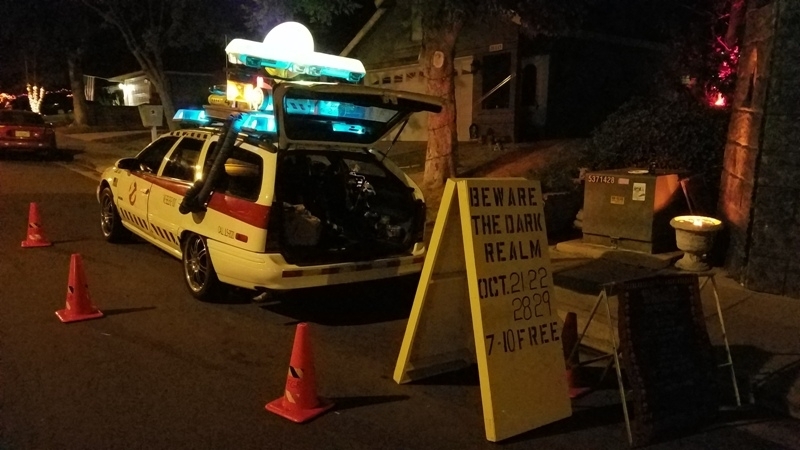 Scott and his son Christian put this on annually with 2016 marking the 45th year for Scott, and their 28th year in Santa Clarita. 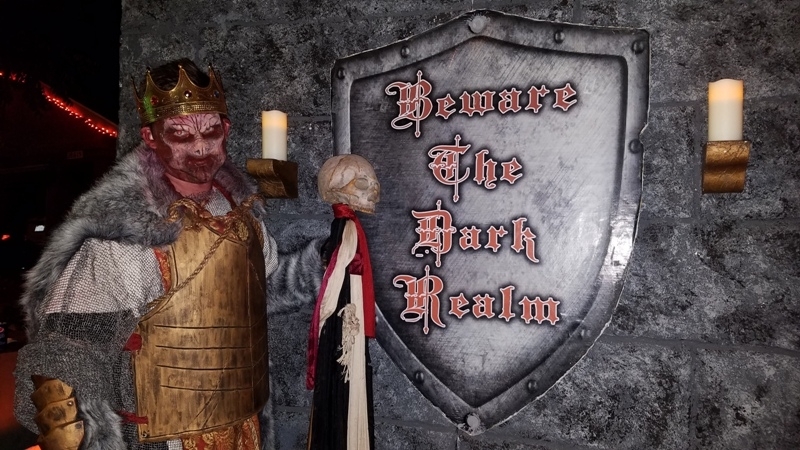 Beware the Dark Realm is located in the northern part of the Santa Clarita Valley, about 7-8 miles northeast of Six Flags Magic Mountain. They've used different themes over the years. 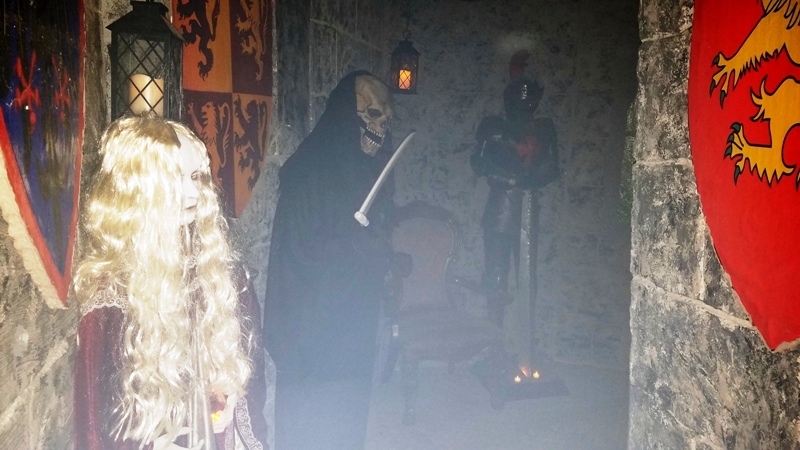 The current haunted medieval castle theme has been going since 2013. Every year Christian and Scott make changes and enhancements and it really shows in what they're able to do. 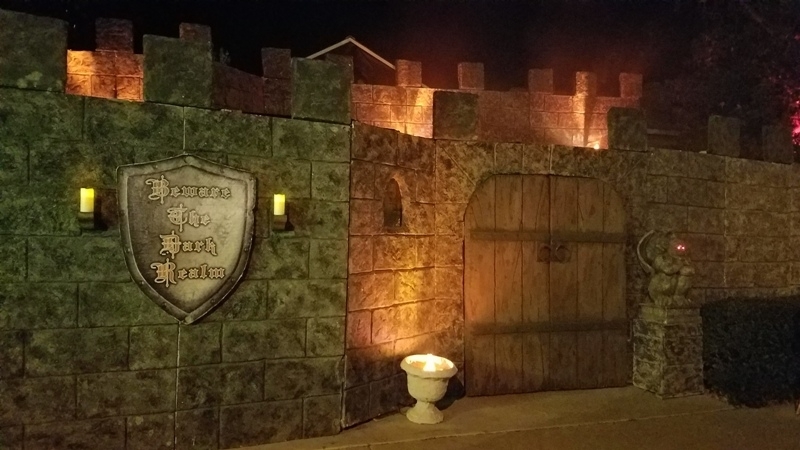 The haunt includes an amazing castle façade built up around the garage and front yard of their home, multiple elaborate sets, some cool lighting and strobe effects, and of course, monsters! 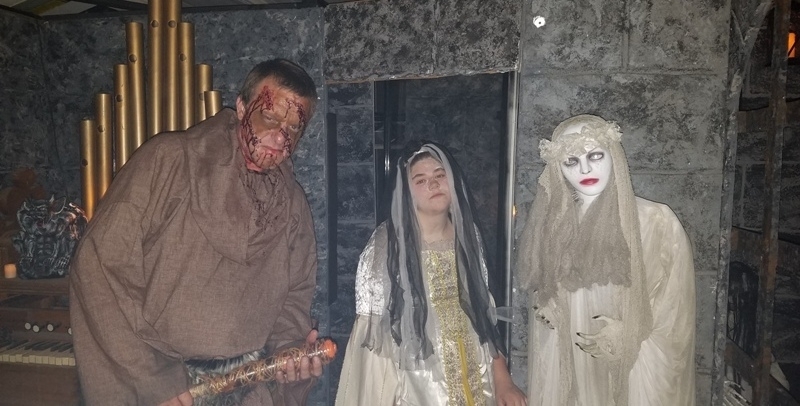 The attraction is open Friday and Saturday nights the weekend before Halloween and the weekend of Halloween from 7pm-10pm, with non-scare group tours offered beginning at 6pm. For me, seeing this was nothing short of amazing. It's clearly a labor of love given how guests are not charged a dime, though donations of food and/or funds to the Food Pantry are welcomed. Christian and Scott were both very gracious and accommodating. 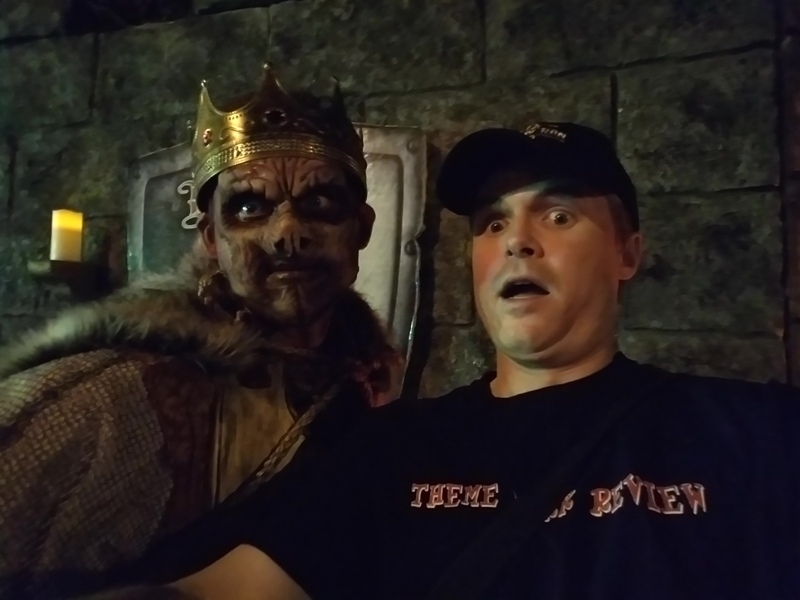 I had a blast going through their maze. 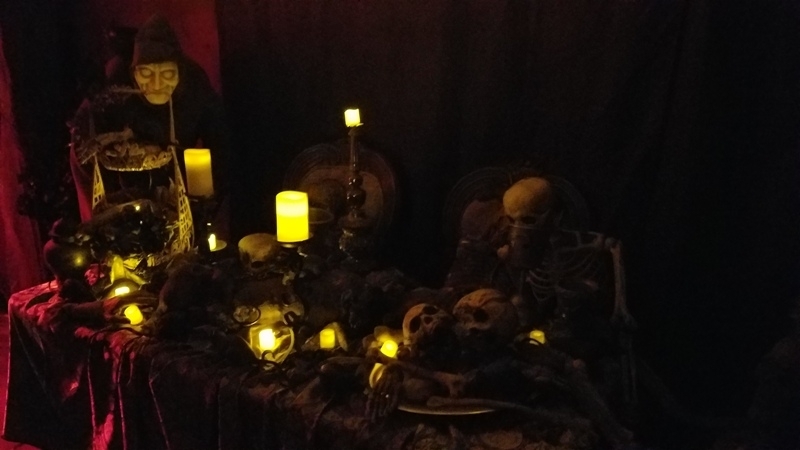 Usually the first night of any haunt includes some technical difficulties, monster talent working their kinks out, etc but I saw none of that. The sets were great. The effects were startling. 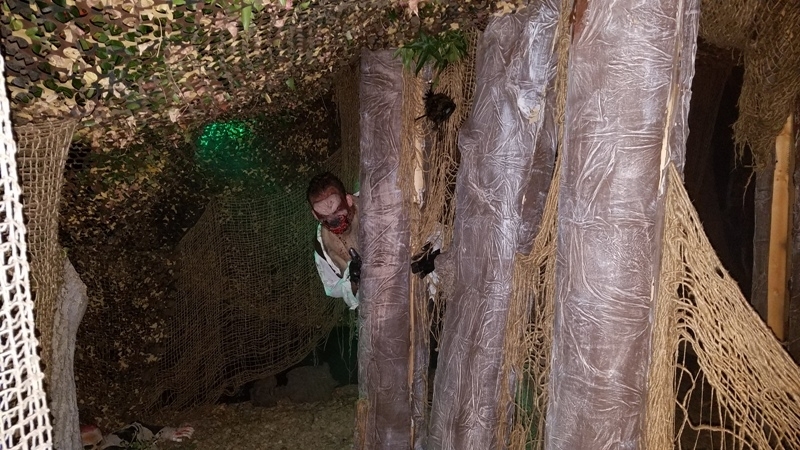 The talent was spot on, knew their roles, had their timing down and they were numerous throughout the maze. 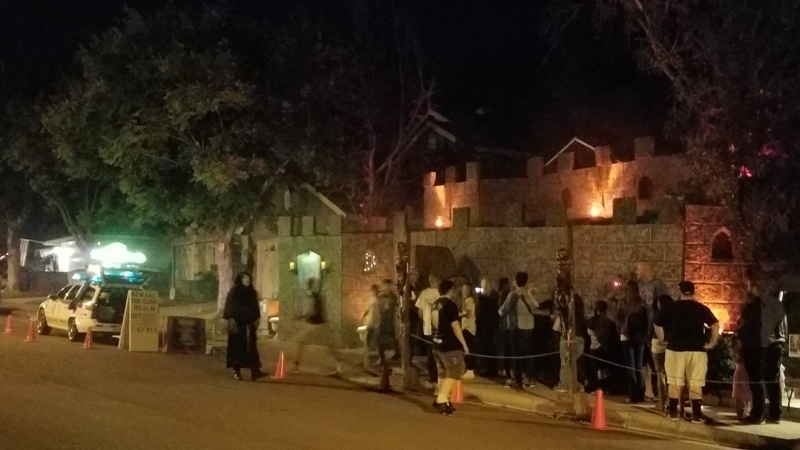 There was a line outside the entrance, but that was mostly because only small groups are allowed to walk through the maze. No conga lines here. 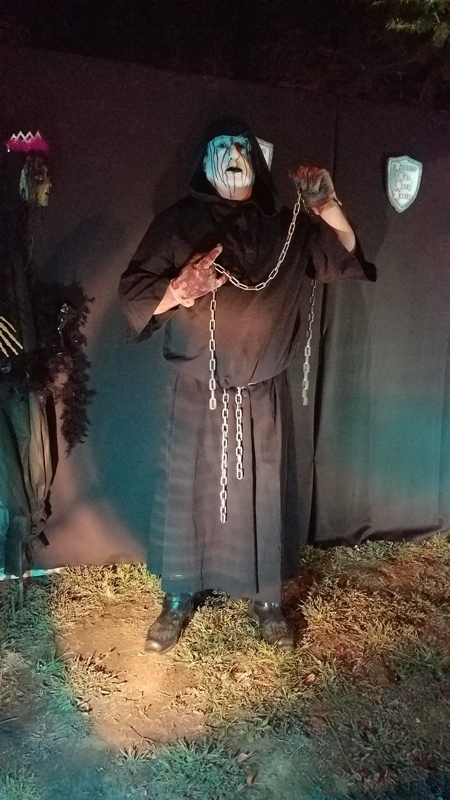 That was a great choice because being in the maze alone or with just your group adds a whole other element to the fright. 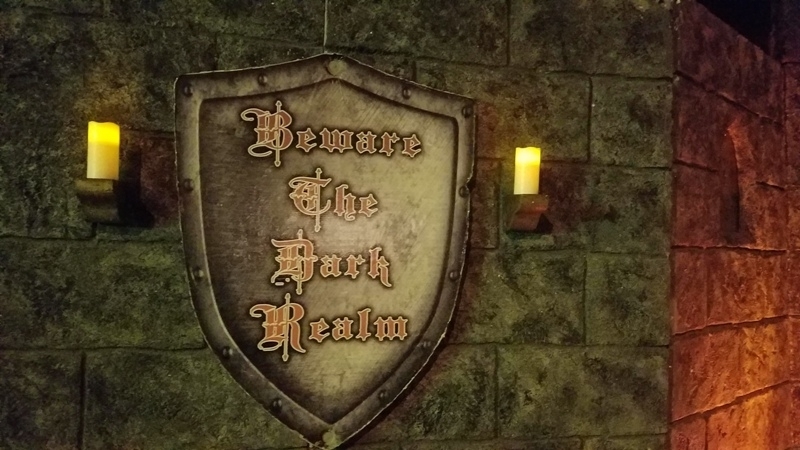 There were some disorienting moments included such as a dead end in the castle's dungeons that only the dungeon inmates can help you out of, a dark forest with multiple dead ends, and a final encounter with a dragon's head before escaping back through the castle gates. How awesome is that, and they don't charge a nickel?? Crazy. 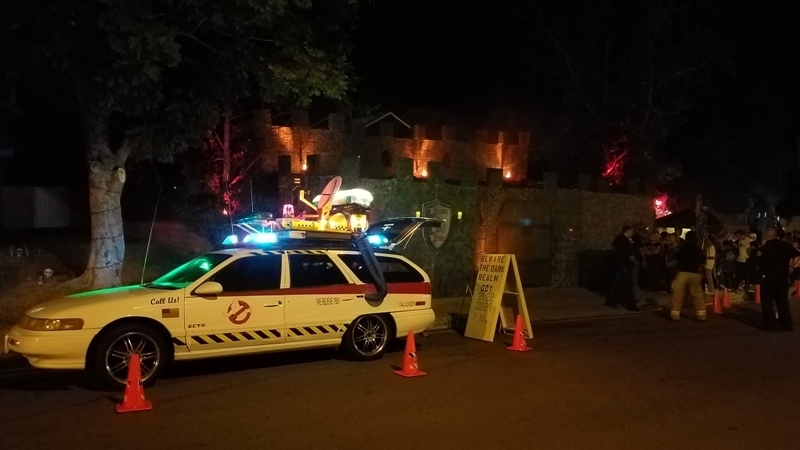 Having been going to theme park haunts for 14 years, I had just as much if not more fun with this as any other theme park haunt I've been to. Christian, Scott, and everybody else involved should be very proud of their efforts in putting this on for the local community. 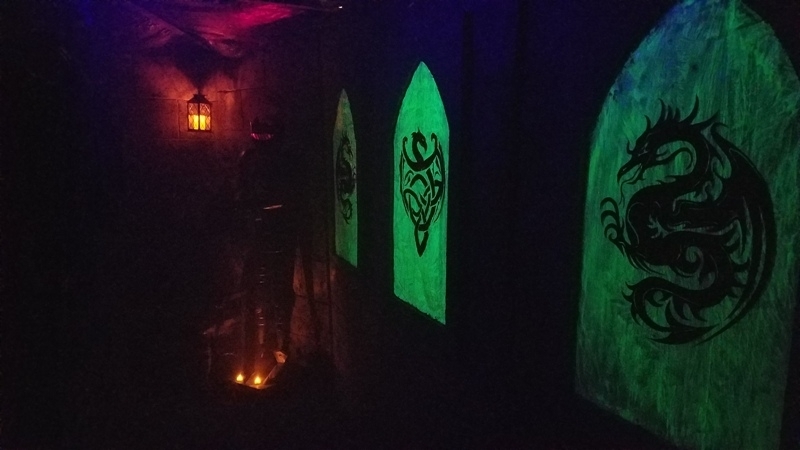 Anybody who's interested in haunted mazes and having fun with them should come by and see the great work they've done here. Let's check out some photos, shall we? 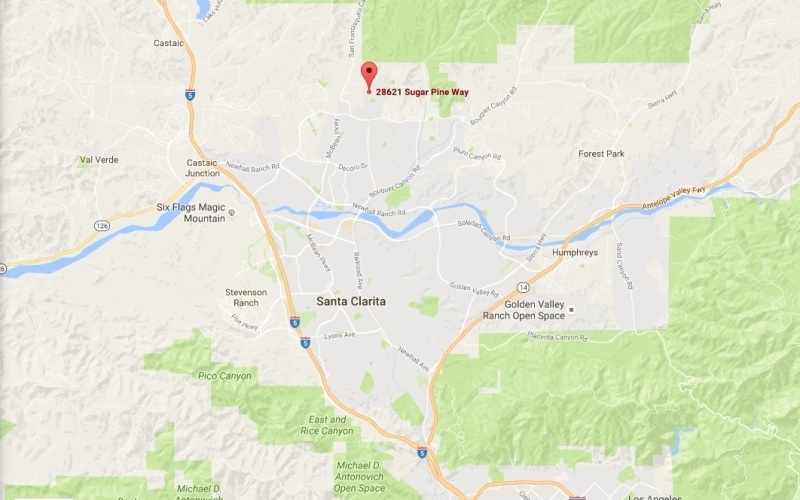 Beware the Dark Realm is located in the northern Santa Clarita Valley about 7-8 miles NE of SFMM, and roughly 35 miles north of downtown Los Angeles. This is being put on for four nights, and did I mention it's FREE? There's a sizeable crowd out front, so of course a couple monsters come out to mess with them a little bit! Hi there! Care to make a donation? Front yard photo op? Check! 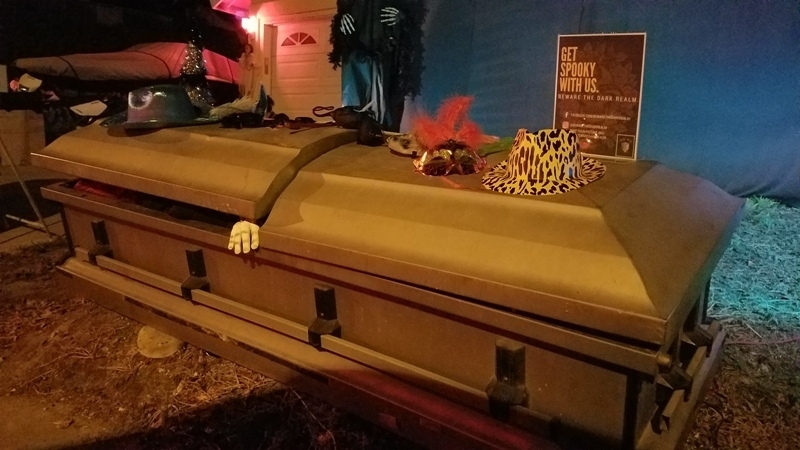 If you've always wondered what a casket in your front yard would look like, now you know! Ahh! I've not yet entered the castle, but the master has already found me! 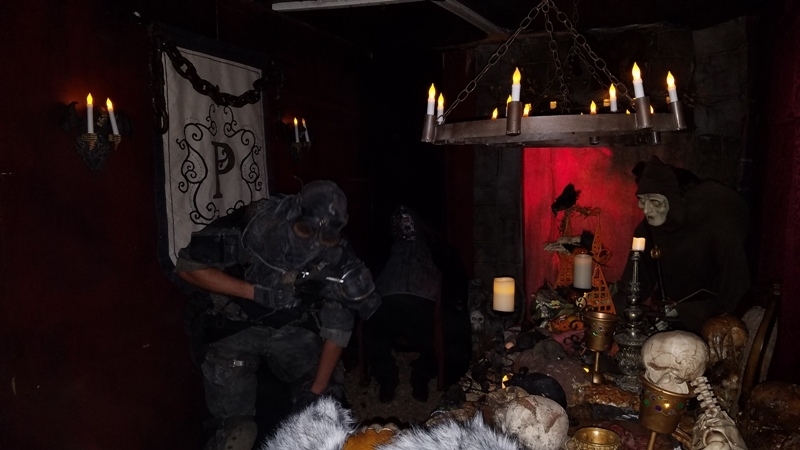 Along with set design and effects, they've done a fantastic job with costuming and makeup as well. 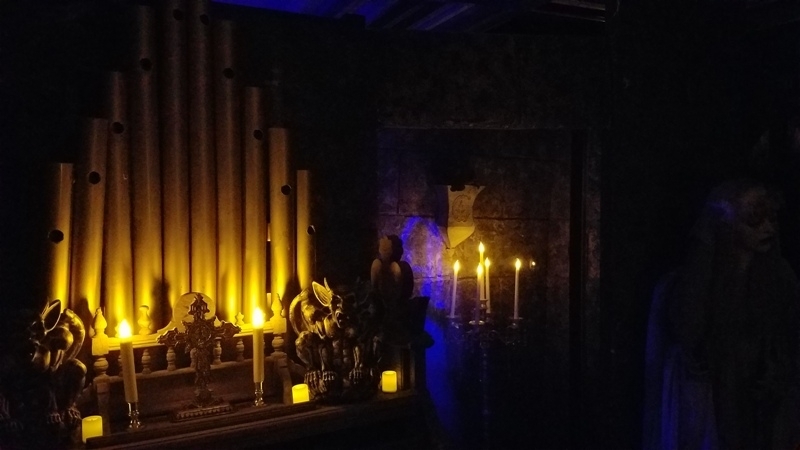 The bluish blob next to the organ is one of the maze's best effects - the ghostly image of a woman dancing. 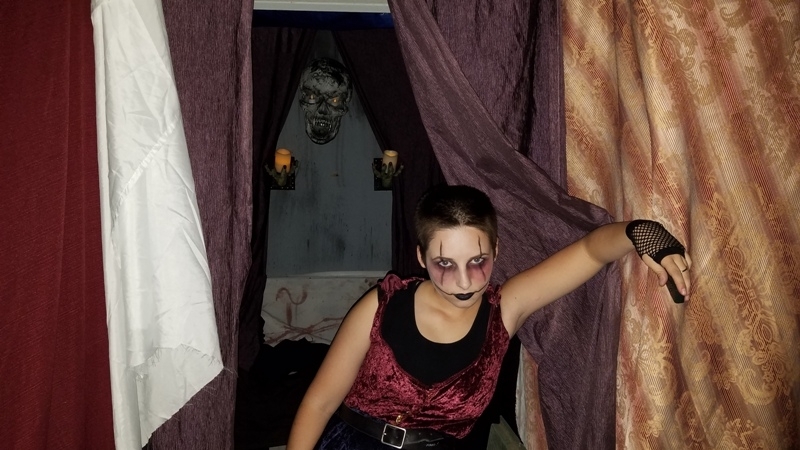 She came bursting out of that room with a flashing strobe that created a weeping angel effect. Loved it! Remember the ghostly image of the girl dancing? That would be her in the middle. 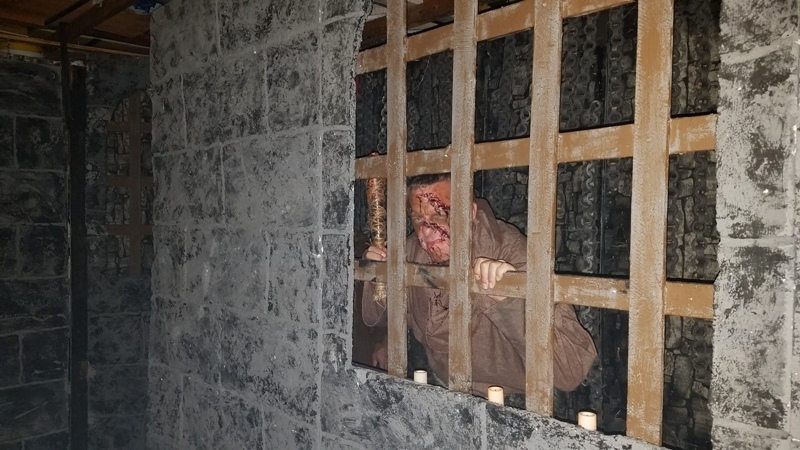 On the left is a dungeon prisoner. In what's probably my favorite part of the maze, this is actually a dead end and only HE can open the cell door to allow you to proceed. 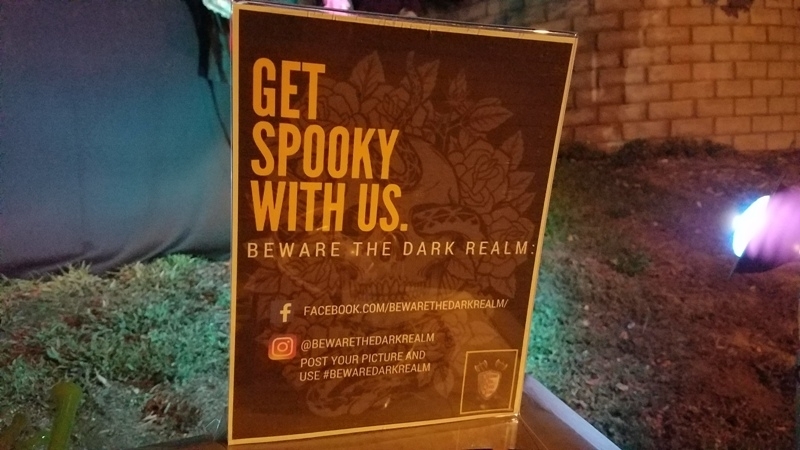 Come check out Beware the Dark Realm! They do a fantastic job! Also check them out on Facebook and Instagram. Thanks to Christian and Scott for the invite! You guys are awesome! 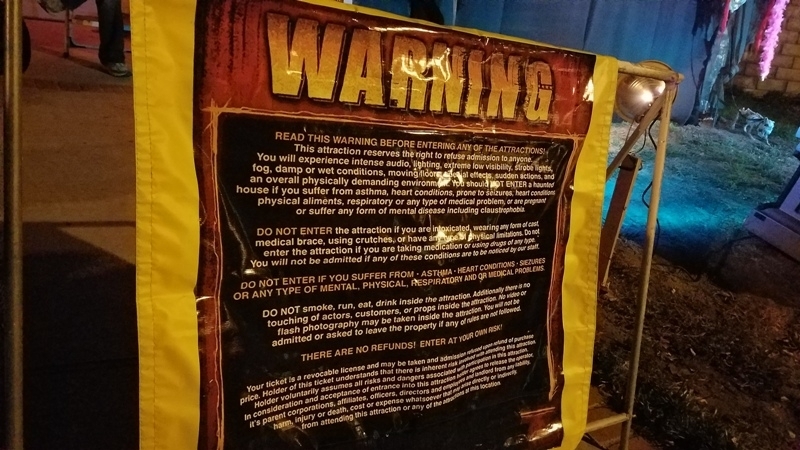 Something of note, the warning sign had a section dedicated to "no refunds" for the free maze. ^ Well they do accept cash donations in addition to food, but I can't imagine someone being dickish enough to want their *charitable donation* refunded because they were somehow unsatisfied by the maze. That means that you won't get your soul back! 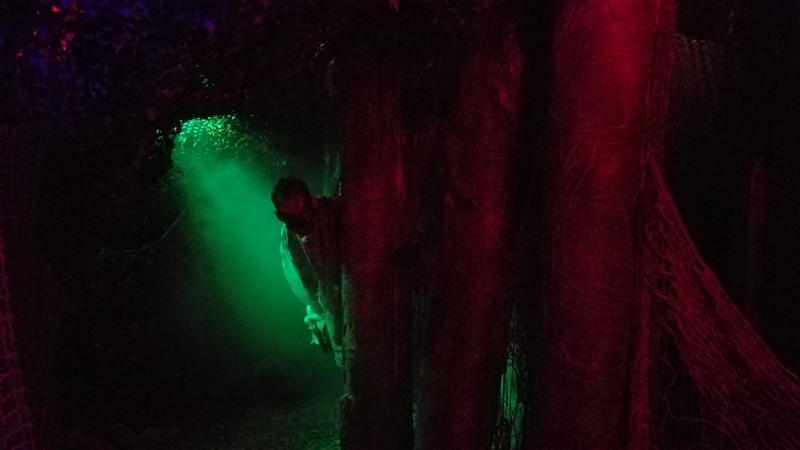 This looks excellent, especially for a "free" haunt. I'd be willing to pony up for some canned goods to check this one out. This looks amaze! Love the castle facade that hides the house. 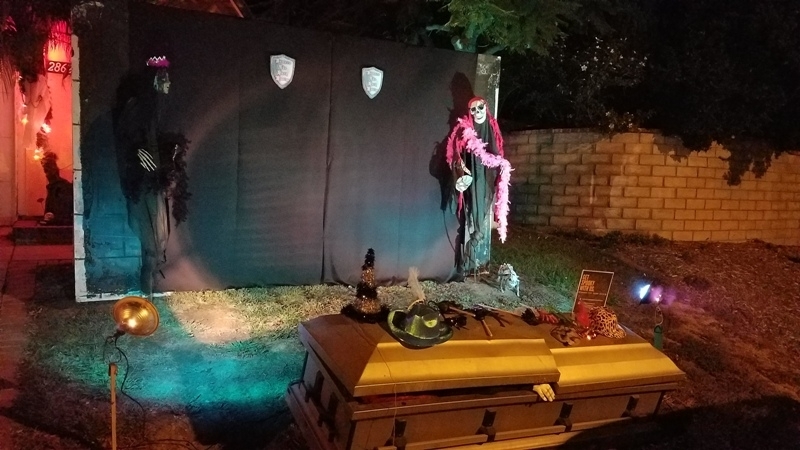 I do a haunted house every year through my backyard and garage, but it's no where as detailed as this. 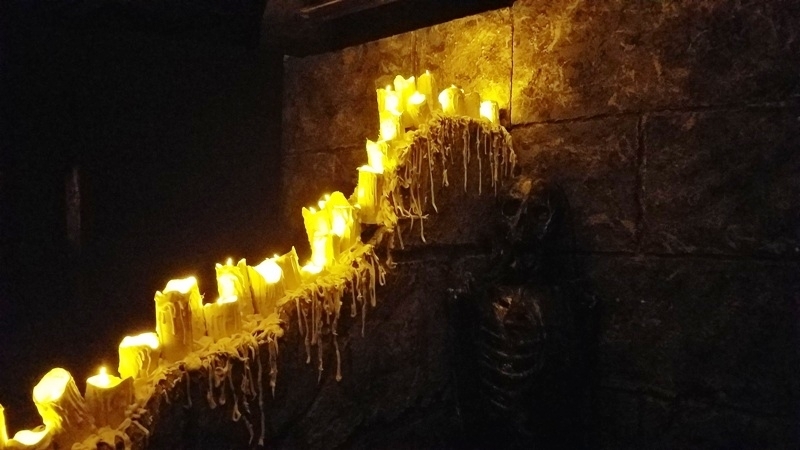 Looks amazing for a free Haunt! They did a great job!